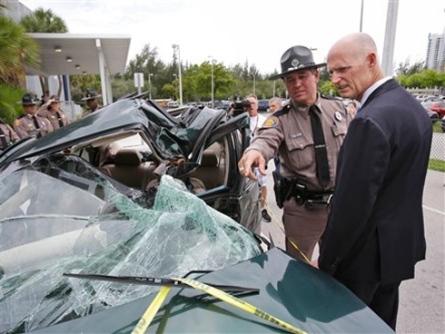 On October 1, 2013 at 12:01 a.m., the new “Florida Ban on Texting While Driving Law” goes into effect. A person may not operate a motor vehicle while manually typing or entering multiple letters, numbers, symbols, or other characters into a wireless communications device or while sending or reading data on such a device for the purpose of non-voice interpersonal communication, including, but not limited to, communication methods known as texting, e-mailing, and instant messaging. As used in this section, the term “wireless communications device” means any handheld device used or capable of being used in a handheld manner, that is designed or intended to receive or transmit text or character-based messages, access or store data, or connect to the Internet or any communications service as defined in s. 812.15 and that allows text communications. For the purposes of this paragraph, a motor vehicle that is stationary is not being operated and is not subject to the prohibition in this paragraph. Committing the infraction of texting while driving will be a secondary offense, same as the seat belt law when it was first introduced. Simply put; a law enforcement officer cannot conduct a traffic stop based solely on a person texting while they were driving. The officer must first have the intention of stopping someone say for a broken tail light, at which time if the officer observes the driver texting, a citation can then be issued for both offenses. If a driver is cited for texting while driving during a traffic stop, the fine will be $30.00 for the first offense and $60.00 for a second offense. According to the Florida Highway patrol, one out of five people are killed in distracted related accidents involving cell phones on a daily basis. Officials have indicated driving while texting is just as dangerous, possibly even more dangerous than driving while drunk. Many law enforcement agencies feel the fines are not high enough to actually prevent drivers from texting while driving, but they also say it’s a start that is long overdue.